RLS’s letters give an invaluable insight into his life, travels, feelings and writing. In this section you will find information about different editions of the letters that have been published. The first section includes all the different publications of the letters through to Bradford A. Booth and Ernest Mehew’s indispensable The Letters of Robert Louis Stevenson, 8 vols (New Haven: Yale University Press, 1995). The section New Letters includes letters that were published or discovered after Booth and Mehew. 1892-1894 Letter Register (Letters sent and received by RLS). Beinecke Library, Yale, B 6517. 7 pp (list of persons RLS wrote letters to, and on p. 6 a list of persons from whom he received letters in July 1893. Contents of some of the letters are briefly indicated. Unpublished). 1895 Colvin, Sidney (ed.) (1895). Vailima Letters. London: Methuen. 1898-1899 Colvin, Sidney (ed.) (1898-9). ‘The Letters of Robert Louis Stevenson’. Scribner’s Magazine 25-6 (Dec 1898 – Nov 1899). 1899 Colvin, Sidney (ed.) (1899). 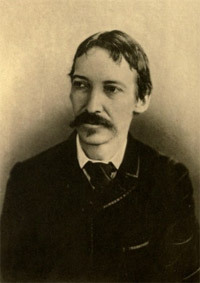 Letters of Robert Louis Stevenson to His Family and Friends. London/New York: Methuen/Scribner’s. 4 vols. 1911 Colvin, Sidney (ed.) (1911). ‘New Letters by Robert Louis Stevenson’. Scribner’s Magazine 49 (April 1911): 385-398. 1911 Colvin, Sidney (ed.) (1911). The Letters of Robert Louis Stevenson A New Edition. Rearranged in Four Volumes with 150 New Letters. London/New York: Methuen/Scribner’s. 4 vols. 1912 New Letters added as 27th volume to the Thistle Edition (Scribner’s). 1924 Colvin, Sidney (ed.). [Letters by Fanny Stevenson]. Scribner’s Magazine *** (March 1924): *** / Empire Review [London] ***: ***. 1924 Colvin, Sidney (ed.) (1924). Letters (ed. S. Colvin). vols. 31-5 of ‘The Tusitala Edition’. London: Heinemann. 5 vols. 1948 Smith, Janet Adam (ed.) (1948). Henry James and Robert Louis Stevenson. A Record of their Friendship and Criticism. London: Rupert Hart-Davis. 1956 Ferguson, John De Lancey & Marshall Waingrow (eds.) (1956). RLS: Stevenson’s Letters to Charles Baxter. New Haven: Yale UP. Repr. Port Washington: Kennikart Press (1973). 1962 Booth, Bradford A. (Introduction) (1962). R. L. Stevenson to J. M. Barrie: A Vailima Portrait. San Francisco: Book Club of California/ Grabhorn Press, 1962. Limited edition of 475 copies. With MS facsimile and 4 drawings by Isobel Strong. 1992: Escaig, François (ed.) (1992). M. Schwob/R.L. Stevenson: correspondences. Paris: Allia. 1994-1995 Booth, B.A. & E. Mehew (eds.) (1994-5). The Letters of Robert Louis Stevenson. New Haven/London: Yale University Press. 8 vols. 1997 Mehew E. (ed.) (1997). Selected Letters of Robert Louis Stevenson. New Haven/London: Yale University Press. 1874: Donovan, Stephen. [Verse letter to Marie Johnson, Menton, January 13th 1874, originally published, with facsimile, in The South African Magazine, 1(6), Capetown, Oct. 1906, pp. 733-7]. The text appears in the proceedings of the Gargnano conference (2006) and has also been published in the Roger C. Lewis (ed.) Collected Poems (2003), p. 588. 1878: Rex Maughan (President of the Robert Louis Stevenson Foundation that runs the Vailima Museum in Samoa) discovered a Stevenson letter in the pages of a first edition of New Arabian Nights in the Brigham Young University, Hawaii (David Magee holdings). It adds a sentence before and after to the two sentences to Letter 576 (from a 1921 auction catalogue) in Vol. 2 (p. 284) of the Letters. 1878: MS of a letter of 12 November 1878, published by Booth & Mehew from an accurate copy (Letter 580, v. 2: 286), Robert Louis Stevenson Collection, Special Collections Research Center, Syracuse University Library. 1880: MSS of letters of 19 and 21 December 1880, published by Booth & Mehew from accurate copies (Letter 762, v. 3: 143-4; Letter 763, v. 3: 144-5), Robert Louis Stevenson Collection, Special Collections Research Center, Syracuse University Library. Dear Sir,/ I received only a few days ago your long and interesting letter. I shall make it a point to see your book. I have since camped out in California, where things are mightily simplified by the absence of rain, but made more difficult by the rivers drying up. I recal some miseries after water to drink; and tracking with a compass through thick chapparal and chemise, did not always prove either easy or agreeable. But I was laid down with a fever, and passed some very melancholy nights, when I could not close an eye and could not tell whether I most disliked the glitter of the stars or the piercing cry of the crickets; and to have to cook one’s food became quite impossible. That fever was the beginning of a long illness from which I am still suffering; it may be many years ere I shall again be fit to go a-camping: and perhaps ere health returns, the taste may have departed. In the meantime, the very word is delightful to me to write or to read; and I still cling to the feeling, I fancy a delusion, that two or three nights under the stars would work marvels for my health. / With many thanks for your kindness in writing / P.S. You are very right in what you say. No one who has not tried it can know how much of a strain it is, to push such a journey through single handed, and to keep the hungry journal up to date. When I got to Alais, and had had a hot bath, I felt almost collapsed, though with all the pleasure of rest. Published: RLS Site Newsletter [ed. Richard Dury], 12:3, 13 December 2012, 9-10. Private collection: Mr. P. E. Richard (France). Three pages of text in ink on one small leaf folded to make a four-page folder, with postmarked envelope addressed to: Herbert Smith Esq. | St. Leonards | Bridgenorth | Shropshire. Name is also spelled Herbert at the end of the letter itself. Auction history: Bonhams, London, 19 June 2002. Hubert Smith, Tent Life with English Gipsies in Norway. London: H. S. King & Co., 1873. Tenting expedition in the summer of 1871: author and another Englishman and two gipsies, also gypsy girl Esmeralda, who did the cooking. Donkeys used as pack animals. Hubert Smith, afterwards Hubert Smith-Stainer (1823-1911). British Library lists Norway book and E. S. Dodgson, Hubert Smith-Stanier: a Retrospect, 1823-1911. (Reprinted from the Journal of the Gypsy Lore Society, vol. v., part I. ), Liverpool, . Bodleian Library copy of Tent Life with English Gipsies in Norway. London: H. S. King & Co., 1873 on Google Books, has inserted cutting with 1911 obituary of Smith, who for many years through 1887 had been town clerk at Bridgnorth, succeeding his father. Retired to Leamington. No mention of marriage to gypsy. 1887: Rosemary Clark has discovered a letter to John Alexander White (mid/late October 1887), the American painter who did a portrait of RLS in 1886 – in the Archives of American Art at the Smithsonian Institute, Washington D.C. and will be publishing information on this in due course. 1887: Nash, Andrew (2000). ‘Two Unpublished Letters of Robert Louis Stevenson’. Notes and Queries n.s. 47iii (Sept. 2000): 334- 336. [Two 1887 business letters to Chatto & Windus about Memories and Portraits, one just before 28 July with a list of contents, decision about the title and uncertainty about the inclusion of “Thomas Stevenson”; one 21 August recognising receipt of proofs for Memories and Portraits and appointing Baxter his financial agent; Andrew Nash estimates S’s earnings on M &P as £200 during his lifetime]. 1887: Linehan, Katherine (2003). Two Unpublished Letters from Robert Louis Stevenson to Thomas Russell Sullivan’. Notes & Queries50.iii: 320-323. [the first (7 June 1887) complements Sullivan and Mansfield on the stage version of JH. ]; the second (undated, but between 15 April and 2 May 1888) criticizes the ‘innocent impudence’ of Mansfield in his self-promotion and quoting of S’s letters and conversations without permission. 1887-1888: Undated and apparently unpublished letter to a Mr. Johnson, framed with a copy of the studio portrait by Notman of New York (September 18887). Sold April 2005 for over $1,400. The addressee is undoubtedly Robert Underwood Johnson (1853-1937), secretary of the American Copyright League and editor of the Century Magazine, and the person referred to at the end of the letter must be James Russell Lowell (1819-1891), poet, first editor of the Atlantic Monthly and another campaigner in aid of international copyright. I cannot find this letter in the Booth & Mehew edition, but it was probably written during the period on the East Coast of the USA, September 1887-May 1888. It seems that Stevenson had previously met James Lowell. 1892: Colley, Ann C. (2004). Robert Louis Stevenson and the Colonial Imagination. Aldershot: Ashgate. P. 160, Letter Rev. Arthur E. Claxton (who had translated ‘The Bottle Imp’ into Samoan), 27 September 1892 (London Missionary Society Archives, Box 42, Folder 2): ‘it is my painful duty to advise you of the fact that there can be in the future no relations between you and me. Your interview with Mr Sewall (if there was nothing else) marks you as one of those men with whom I must either definitely break or cease to respect myself’. This is actually transcribed by Stevenson himself (with one small difference and without the final salutation in Letter 2463, September 1892, to Sidney Colvin Letters 7: 385). 1892 circa (‘early 1890s’): reply to fan letter from a Mr Brown of New Zealand.- Transcription (from eBay posting, which may not be totally accurate) published in the St Helena Star: ‘Dear Mr. Brown, Thanks for your letter. If boyish at all, it was so in the good sense of which a young man need not be ashamed and an old man (if he can preserve it) has cause to be proud. I am glad to have interested you; I will tell you in confidence — I only care to be read by young men; they alone can read. I read now; yes, and with pleasure; but some years ago I read with the greed and gusto of a pig, sucking up some of the very paper (you would think) into my brain. And that is the only kind of reading for which it is worth while to support the pains of writing. Yours truly, Robert Louis Stevenson.’ Bought by the Stevenson Museum, St Helena, California. 1894: letter to Robert Reid dated 5th Nov. 1894 in the possession of the Wanlockhead Museum Trust, Scotland. 1894: Katie Fairfax-Ross has a letter in her possession from RLS addressed to her great-grandfather Dr. Fairfax Ross in Australia. It is a letter of presentation dated 25th November 1894 given to Dr Hoskyns of the Curaçao, who ‘will be able to give you all our news, good and bad’. Image from RLS, Letters to His Family and Friends, II, ed. and intro. by Sidney Colvin, Letters and Miscellanies of Robert Louis Stevenson, vol xxiv (New York: Charles Scribner’s Sons, 1903).